I’ve been blessed to have one week at the main centre of News Corp. Talk about a massive building; it’s like people everywhere. Working the “Quest” news section has been really…well it’s been, challenging, rewarding, tiring, enjoyable, I’m sure there’re more words I could add to the list, but I am too tired to think too deeply. The third day in and I’ve come home brain drained, supercharged on coffee, with vague memories of assignments due. As I’m not allowed to say anything apart from boy, the computer screens are massive. No seriously, I’ve been researching material on three stories I’ve been assigned to follow up on. 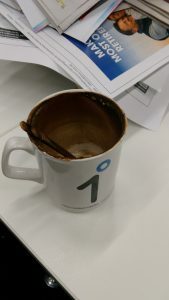 They’re are a few things I can openly share – there’s one reporter who shall remain unnamed, but he has a coffee cup that has history, in other words, it’s known around the newsrooms- It’s called the “cup of doom.” The pictures say it all. Last time it was washed was over four weeks ago. The people here at Quest are friendly and helpful – I’d recommend Quest to anyone looking into local news.